WASHINGTON — The International Spy Museum in D.C. has a very special guest to celebrate Global James Bond Day on Oct. 5: Former 007 himself, George Lazenby, star of 1969’s On Her Majesty’s Secret Service. The museum is also throwing one last party for its Exquisitely Evil: 50 Years of Bond Villains exhibit — which is slated to close for good Jan. 1. Guests can expect music, drinks and after-hours access to the Villains exhibit as well as a Q&A session with Lazenby, which the museum says will feature real spies. There is also a Bond costume contest, photo ops with Bond and the chance to mingle with Lazenby at the exhibit. The Bond Villains exhibit shows connections and contrasts between the Bond films and the actual practice of international espionage. It houses more than 100 artifacts from the Bond film franchise. Those artifacts range from Jaws’ iconic metal teeth showcased in The Spy Who Loved Me (1977) to Oberhauser’s torture chair in Spectre (2015). The exhibit also shows how the plots of the 007 movies have changed to reflect the concerns of the times. 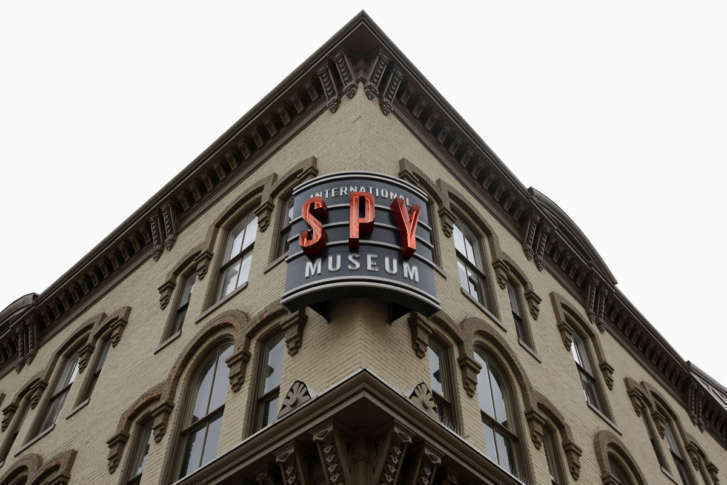 On Jan. 2, the Spy Museum will close its doors in preparation for its move to a new and completely-revamped purpose-built facility in L’Enfant Plaza, which is set to open spring 2019. Global James Bond Day kicks off at the Spy Museum Oct. 5 at 6:30 p.m. and runs until 9 a.m.
Tickets are $35. They include two drinks, light snacks and after-hours museum access. Several years ago, WTOP’s Dave Preston ranked the best James Bond.